The story of young, sensitive, and idealistic Francie Nolan and her bittersweet formative years in the slums of Williamsburg has enchanted and inspired millions of readers for more than sixty years. By turns overwhelming, sublime, heartbreaking, and uplifting, the daily experiences of the unforgettable Nolans are raw with honesty and tenderly threaded with family connectedness — in a work of literary art that brilliantly captures a unique time and place as well as incredibly rich moments of universal experience. I probably never would have put this book on my challenge to read list if it hadn’t shown up as a group read in one of my various goodreads groups. But now that I have read it, I can’t believe that I hadn’t before. And come to think of it, I don’t recall even really hearing about it – although apparently it is still used on school reading lists. (My library has all the reading list books separated from the standard YA, so they are easy to find). 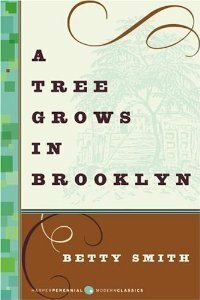 A Tree Grows in Brooklyn is such a simple tale – the story of Francie growing up in Williamsburg, a part of New York (although every time I see that town name, I think of Williamsburg, VA). She goes through the same trials that most kids do – going to school, dealing with boys, first love, but on top of all that, an alcoholic father and being exceptionally poor. I loved seeing her mother (who some reviews describe as being cruel, although I don’t agree) teaching Francie and her brother about the value of money and saving towards a goal (with the tin cup that they nailed in the cupboard at each house they moved to). Or the love of learning that she inspired in them, through Shakespeare and the bible. Even now, over 60 years since it was originally written, I can see how kids can relate to the going-ons. Not necessarily the time period specific, but the general themes of growing up and finding your place in the world. Being the sucker that I am for happy endings, I wonder what would happen if a sequel was ever written – What did Francie end up doing with her life – Did she finish going to college? Did she get over her first love and subsequent first heartbreak? But at the same time, I don’t want to know because I can imagine various different endings all I want and a sequel would change that. This is a book that I would recommend to pretty much anyone, but I do think that teenage girls would enjoy it the most because of the themes and the characters. I think most girls growing up probably read the story of the red-haired orphan adopted by Matthew and Matilda Cuthbert, set in Canada. For me, it had been nearly two decades since i had read it, but I still had fond memories, so after listening to my previous audiobook that had me bawling, I decided that I wanted a feel-good book to listen to. (Unfortunately, I forgot how moving and cry worthy AoGG was). But this is definitely a book that to me has stood the test of time – I laughed and I cried along with Anne as she struggled to find her place in life and society. I do have to admit that I was surprised by how much my memories of the book were jaded by the movie version that I had seen. While I have planned on writing a book to movie post, a few thoughts. 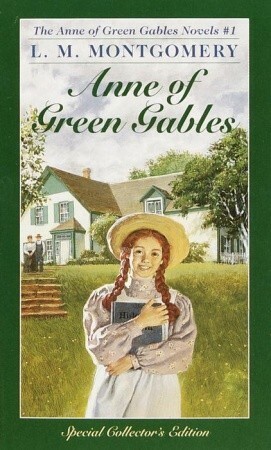 Anne and her dress with the puffed sleeves – this was probably one of the parts of the book I thought that I remembered the most, but I was surprised to find that what i thought occurred in the book, was primarily in the movie. The same with how the book ended and the death of a main character (I mean, I could spoil it by saying who it was, but there are still people out there who haven’t read this classic, so I won’t). 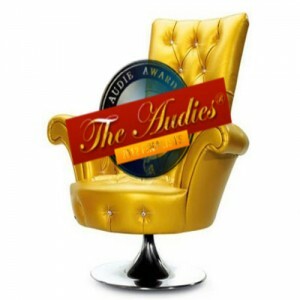 It has been a while now since I listened to the audiobook, so I really don’t have much to say about the narrator – it wasn’t bad enough to stick out in my mind, but at the same time wasn’t one the best narrators I have listened to in the past. It was only good – I wish I had more to say about it, but I don’t. The production of the audiobook was a bit funky in that you could hear where it had been re-mastered and the quality of the book changed through-out – there were parts where it was super quiet, and others where it got really loud – I’m personally not a fan of having to adjust the volume on my ipod in the car like I was having to with this verison. I’ll be the first to admit that I avoided classics like the plague in high school and college. I just had no interest in reading them. Normally opting instead to read a more contemporary romance novel of some shape and size. It hasn’t been until the last few years that I have actually opted to start reading these classics. Having previously read/listened to Jane Eyre by Charlotte Bronte (loved it) and Wuthering Heights – Emily Bronte (hated it with every fiber of my being), I decided it was time to give Anne Bronte a try. I had previously listened to Tenant of Wildfell Hall also by her and this time opted to listen to Agnes Grey. It is written very much like a autobiography of someones life and there is some evidence that suggests that AG is actually the story of Anne’s experiences as a governess. If that is the case, I have to admit that I pity her for her experiences. Having previously worked as a nanny, I can say that I would have been driven nuts by some of the antics of her charges, and I likely wouldn’t have been able to deal with them.